The CGSim (Crystal Growth Simulator) code is specialized software for simulation of Czochralski (Cz), Liquid Encapsulated Czochralski (LEC), Vapor Pressure Controlled Czochralski (VCz), and Bridgman growth. The code provides information to growers on the most important physical processes responsible for crystal growth and quality. The CGSim package contains several modules such as Basic CGSim, Defects, Flow Module, and CGSim View. Control and optimization of the crystallization front geometry and V/G distribution by adjustment of the hot zone and growth parameters. Increase of the crystallization rate with keeping high crystal quality. Control over stress and defects in the growing crystal. Defect engineering via accurate adjustment of the heat shields. Governing melt convection via crystal/crucible rotation rates, magnetic fields of various strength and orientation. Stabilization of convection in the melt while maintaining reasonable turbulent mixing. Analysis of impurity transport in both the melt and gas. Prediction of oxygen and carbon containing species concentrations in Si CZ growth. Adjustment of growth conditions and modification of the hot zone aimed at providing desired impurity concentrations. Adequate account of encapsulant, turbulent gas flow, and convective heat transport in liquid encapsulated growth. 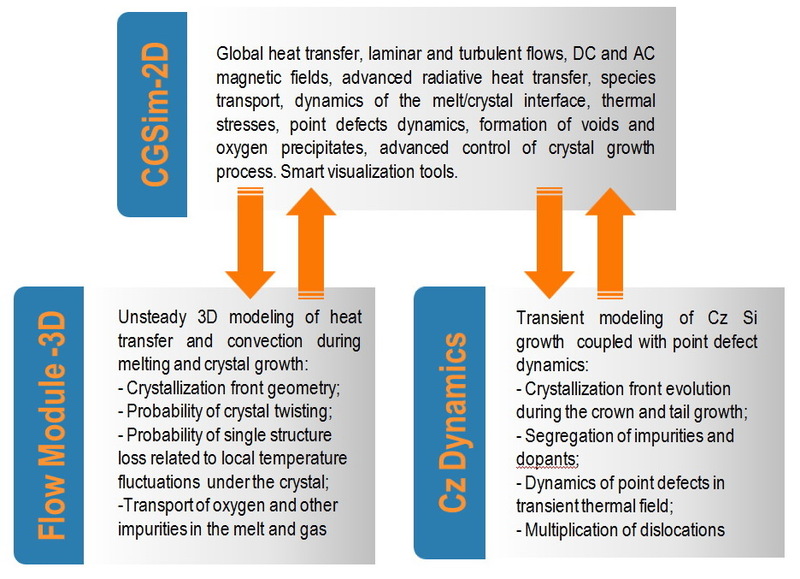 Modelling support for design and optimization of new crystal growth setups. CGSim View allows analysis of 2D and 1D distributions including heat and mass fluxes, V/G ratio and temperature gradient along the crystallization front. Additionally, 1D distributions along a boundary can be displayed as a plot and stored in a file on a hard disk. Built-in animation tools help to analyze features of 3D melt convection.